Banking Awareness is an important section in the employment related competitive exams in India. 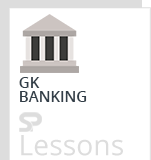 In particular, exams like IBPS, SBI and other bank related employment exams have banking awareness questions along with general awareness section. The Banking Awareness section primarily has questions related to the History of Banking, Banking Terms, Banking Products, Functions of Banks, Banks and their Taglines, Schemes, Committees related to Banking, Headquarters of Banks, most recent Banking News, Apps launched by Banks, New Schemes, Monetary Policies etc. Banking Awareness Quiz 2 – Practice Sets article provides the list of several bank related questions to prepare aspirants of different competitive exams in India, primarily for banking related employment. The article Banking Awareness Quiz 2 – Practice Sets is very useful for different exams such as IBPS PO, Clerk, SSC CGL, SBI PO, NIACL Assistant, NICL AO, IBPS RRB, Railways, Civil Services etc. Q1. Commercial Papers is issued by whom? Q2. Who has coined the term ‘Gross National Happiness’? Q3. Credit History of the Borrower is provided by which Organization? Q4. In Gross National Product, which of the following contributes the highest? Q5. Which of the following regulates the Mutual Fund? Q6. What do you mean by ‘Flat Money’? Q7. Core banking infrastructure is done by which of the following? Q8. What do you mean by Gross Domestic Product? Q9. What do you mean by Factoring? Q10. Which organization of the following can avail the Refinance Facility? Q1. In India, largest share of GDP comes from which of the following sectors? Q2. Who sets up ‘Base Rate’ for Banks? Q3. What is known as the Bank advances of a bank ? Q4. Human Development Index is indicated by which of the following? Q5. Who are benefited by the Reserve Mortgage Scheme? Q7. Which of the following is reduced by the the higher growth rate of the economy? Q8. IRR stands for which of the following? Q9. To avail the facility of locker, a customer have to pay which of the following? Q10. BR Act stands for which of the following? Q1. Which of the following is the unit of money whose face value and intrinsic value are equal? Q2. What is the full form of EMI? Q3. Regional Rural Banks are sponsored by which of the following? Q4. Reserve Bank of India is established in which year? Q5. Which of the following is/are Optional Money? Q6. Which of the following bank was known as Imperial Bank of India before Nationalization? Q7. Which of the following is called as Non-Legal Tender Money? Q8. Which of the following is not a Representative Money? Q9. Banking in India is controlled by which of the following ? Q10. Which of the following is associated to teaser rates? Q1. Which of the following decides the Bank Rate? Q2. FCEB stands for which of the following? Q3. Which of the following is a banking term? Q4. PSLC stands for which of the following ? Q5. In which city the head office of RBI is located? Q6. Who regulates the insurance sector of India? Q7. IDF stands for which of the following ? Q8. SBI has entered in a joint venture with which of the following for undertaking general insurance business? Q9. Credit Cards are known as which of the following? Q10. Which asset can be mortgaged? Q1. Crossing applies to which of the following instruments? Q2. A savings bank account opened with a zero balance of minimum balance is known as which of the following? Q3. NOF stands for which of the following? Q4. Which of the following is not a classification of Scheduled Banks? Q5. BFS stands for which of the following? Q6. NABARD was established in which year? Q7. In which year BFS was constituted? Q8. CSR stands for which of the following? Q9. The member of BFS board is chaired by whom? Q10. Who is the chairman of NABARD? Q2. Which of the following are the main products of Retail Banking? Q3. LAF stands for which of the following? Q4. Who administered Monitary Policy? Q5. Which of the following statements is/are true about Scheduled Bank? D. It is included in the Second Schedule of Reserve Bank of India Act, 1934. Q6. Which of the following is related to Kapoor Committee, 1999? Q7. Which of the following deals with the small and medium enterprises? Q8. The Bank that begins with “U” is the tagline of which of the following bank? Q9. The major stakes of NABARD is owned by whom? Q10. AEP stands for which of the following? Q1. Who issues the Sovereign Gold Bond? Q2. DRI stands for which of the following? Q3. What is the minimum investment in SGB? Q4. Which of the following banks offer loans to the poor to construct or buy houses? Q5. Which of the following Government Bodies carry out the appointments of the Banking Ombudsman? Q6. What do you mean by ‘Tax Haven’? Q7. Which of the following is not included in the Priority Sector? Q8. Which of the following can be called as a non-institutional lender? Q9. In which city the head office of NABARD is situated? Q10. In which city, RBI does not have a regional office? Q1. Which of the following terms is used in Banking and Finance? Q2. ‘Your Perfect banking Partner’ is the Tag line of Which bank? Q3. The head office of Bank of Maharashtra is situated in Which of the following cities? Q4. To open a new Branch, a Bank must have the permit from RBI under which of the following acts? Q5. A fixed deposit receipt which a bank keeps for its safety is known as which of the following? Q6. The head office of Vijaya Bank is situated in which city? Q7. In which year the Credit Guarantee Corporation is created? Q8. In which city the biggest International Financial Center is located? Q9. With which of the following organizations, the mutual funds should be registered? Q10. Kelkar Committee is associated with which of the following? Q1. ADB stands for which of the following? Q2. The bank where the majority( more than 50%) stake is hold by Govt. is known as which of the following? Q4.’Together We Can’ is the Tagline of which bank? Q5. In which year Indian Overseas Bank is Nationalized? Q6. RBI is going to launch which of the following currency notes for the first time? Q7. Which of the following countries voluntarily contribute first to the UN Tax Fund to help the developing countries? Q8. Which of the following is known as the Money loaned by a bank or other institution which is repayable on demand? Q9. DHFL was set up in which year? Q10. Which of the following is/ are the advantage(S) that are offered to a SEZ? Q1.SEBI was set up in which year? Q2. Who is the President of ADB? Q3. Which of the following statements shows the assets and liabilities of a business at a certain date.? Q4. How is the Interest on the savings bank accounts compounded? Q5. Which of the following bodies determine Rates of Interest on deposits? Q7. Who is the Chairman of GST Council? Q8. GST was passed through which Amendment Bill of the Constitution? Q9. NUUP stands for which of the following? Q10. Which of the following taxes arebounded with GST?